T-Mobile announced today that its free unlimited video streaming program Binge On now supports an additional 13 services, headlined by NBC and video content from existing Music Freedom partners Google Play Music, Radio Disney, Spotify, and TIDAL. The other additions include Great Big Story, Kiswe, Ligonier Ministries, NOGGIN, Qello Concerts, Univision, Univision Noticias, and Toon Goggles. Binge On now supports over 80 video services in the United States. 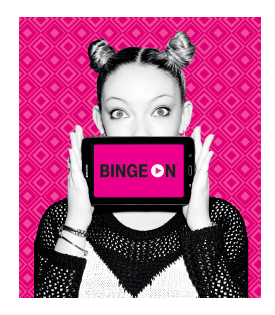 Binge On is a free incentive that enables T-Mobile customers on a qualifying Simple Choice plan to stream unlimited 480p video from dozens of partnered services, including Netflix, HBO NOW, Hulu, and YouTube, without any of the data consumed counting towards their plans. T-Mobile added 16 new Binge On and Music Freedom partners in April. Does that mean they would throttle sound quality on TIDAL? Because that would defeat the point of having a TIDAL subscription. Yes and no. Yes TIDAL would get swept up in the wave <-- see what I did there? - but you can opt out of Binge On for your TIDAL streaming <-- and there?. After that, it smooth sailing. T-Mobile is really doing some great things for their customers. Other carriers need to follow. I'd agree with you, except perhaps in this instance ... Legere can dress it up all he wants, but essentially Binge On is just data throttling. But it is great for people with smaller data plans or who aren't on unlimited; it's just not for everyone. The thing is, all of the controversy about Binge On could have been solved if it was simply an opt-in service rather than an opt-out. That's it. Yes that would fix everything because clicking a button is so difficult. Have to disagree. They did the right thing. You can you imagine the crap they'd get that they advertise free streaming for these services only for a customer to find out that all the streaming they THOUGHT was free, is actually being counted against them? Hell if you do, hell if you don't. They chose the right one because the other would have probably resulted in a lawsuit for false advertising. I've said this many times before... I really really can't wait to switch to T Mobile. T-Mobile's 6GB plan is a great deal, especially when you combine it with previous and current promos that offers the plan for the same price as the base 2GB plan. Previous promo was $80 for 2 lines with 6GB each ($20 for each additional line with 6GB) and current promo is $120 for 4 lines with 6GB each ($20 for each additional lines). In addition to Binge On and Music Unlimited, T-Mobile does not count data used toward (1) downloading and updating apps on the App Store, (2) running speed test using Ookla Speedtest and few others apps, and (3) T-Mobile mobile apps. Combined with (1) 20GB Data Stash, (2) more services being added every few months, and (3) T-Mobile doubling data every year or two, most people probably would do just fine with T-Mobile's limited data plan. [doublepost=1463503213][/doublepost]Binge On is a violation of Net Neutrality principles. If the internet is to be free and democratic, ISPs like T-Mobile can not be allowed to favor data transmission from content providers, in essence, setting themselves up as internet gatekeepers who determine the winners and losers online. You can argue that their original implementation was a violation of net neutrality. But T-Mobile has since opened up. Binge On is now opened to any one who provides legal video contents with a separate stream optimized for 1.5 Mbps bandwidth. And it's up to the service to decide whether to handle the throttling themselves (e.g., YouTube) or let T-Mobile manage it. All of the Binge On in the world won't fix the fact that their coverage is terrible. Even Sprint is better than they are where I'm at, despite what their fancy map says. I see you've had your morning glass of prune juice. I was just pointing out that for all the controversy that Binge On got -- and it has got lots of controversy in the media, which in itself caused bad TMob publicity, and forced Legere to publicly defend the decision with Twitter Q&As -- all of this could been avoided just by making it opt-in. For instance, there were a large number of users who were unaware about Binge On, and suffered with streaming quality/video buffering as a result of it automatically being applied to their account. After calling TMob support, they suggested turning off a feature that they didn't know had been applied. All of that could have been so easily avoided by the carrier just by making it opt in. I really can't believe you'd advocate otherwise.